Franck Ribery’s social media outburst was the result of a prolonged period of abuse, according to Bayern Munich’s Thomas Muller. 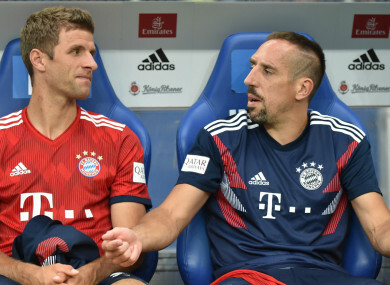 THOMAS MULLER DEFENDED Franck Ribery’s “emotional” nature following the Bayern Munich winger’s foul-mouthed response to social media criticism. Bayern fined 35-year-old Ribery after he unleashed an expletive-laden Twitter and Instagram outburst towards “the haters” who ridiculed a video in which he posed with a gold-coated steak, reportedly worth €1,200. The former France winger was visiting celebrity chef Nusret Gokce, an internet sensation nicknamed Salt Bae, at his Dubai restaurant. Muller admitted Ribery was more susceptible to provocation than most but insisted his team-mate’s behaviour was understandable. “In those moments when he feels unfairly treated, where he is badly attacked… he just cannot control himself,” Muller told reporters at the club’s mid-season training camp in Qatar. “He is a very emotional person, as he has experienced [abuse] in his entire career so far. “But I think he has become better over the course of his career, even if there are always such situations. It is true that he is attacked a lot. We know that Franck is an absolute team player, but if he feels aggrieved of course he has often defended himself – even with means that may well be overdone for others. He may see it differently because he feels it differently. Muller stressed the incident had not affected the squad’s concentration on preparing for the second half of the season, adding: “Of course, these are topics that bring a bit of unrest, but rather for our sports director, the chairman or the press department. Ribery, who has been with Bayern since 2007, has scored four goals in 14 Bundesliga appearances this season. Email “Muller backs Bayern team-mate Ribery after expletive-laden social media outburst”. Feedback on “Muller backs Bayern team-mate Ribery after expletive-laden social media outburst”.